As the end of the first season of The Eighth Doctor Adventures begins to near its end with the final story before what will assuredly be a monumental two-part finale, Paul Sutton’s ‘No More Lies’ is tasked with telling its own satisfying tale while ramping up the momentum and progressing the lingering Headhunter storyline. As the Doctor and Lucie crash a garden party with a strange link to a disintegrating spaceship, they soon find that they are not the only uninvited guests. 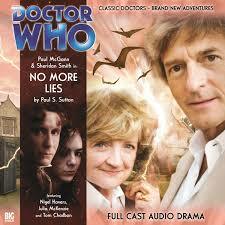 ‘No More Lies’ takes the always-intriguing approach of opening with the Doctor firmly embedded in the middle of the action. However, Sutton focuses more on getting the Doctor and Lucie to the garden party rather than explaining why exactly they are initially chasing after Zimmerman or what his motivations are. This isn’t overly important in the grand scheme of things, but it does mean that the opening scenes that rely more on noise than dialogue and explanation are somewhat disjointed from the bulk of the story and never perfectly mesh to result in a satisfyingly cohesive whole. Accordingly, the story almost hits a reset button as the narrative shifts to the garden party on Earth, again putting the Doctor and Lucie in the middle of already-established events as they find that Zimmerman has completely changed. Herein lies the story’s unquestioned biggest strength as the relationship on display between Rachel and himself is incredibly emotional and convincing, realistically justifying the abrupt change of characterization and creating an incredibly strong core around which to base this portion’s more fantastic elements. Thus, the creation of the time loop and the fear, anxiety, and despondency experienced as it begins to come apart are given the poignant anchor they need to carry events through to their conclusion. Together, these elements help to compensate for the Tar-Modowk, a serviceable but fairly banal threat that never quite reaches its villainous potential. Interestingly, for a story that spends no times with exposition, there really isn’t enough material to warrant its full running time. Several scenes and even some characters are present for no real reason that contributes meaningfully to the plot or outcome, and several scene transitions last much longer than in most stories. Fortunately, the music used for these transitions is well-crafted and enjoyable, but the padding as well as the lack of significant backstory give the impression that this is a story that never fully reached completion to more fully elevate its romantic nucleus and wonderful imagery. As a whole, ‘No More Lies’ remains a strong character-based piece and certainly emphasizes the variety that this series can bring while continuing to emphasize a slightly darker edge to the Eighth Doctor and the continuing progression of Lucie as a dynamic companion. Despite the scripting flaws, the strong emotional core and wonderful performances help to provide another memorable tale in their continuing adventure together. It seems clear that much time has passed given how comfortable Lucie is around the Doctor and the TARDIS, and having the Headhunter finally catch up to her bombastically sets the stage for the finale.